Random Musings, Hopefully Insightful Thoughts and Numerically Confusing Analysis. Not many people will know who Luca Pacioli is. 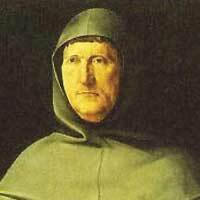 Luca Pacioli is the Father of accounting and bookkeeping. He is the accounting equivalent of Albert Einstein to the Theory of General Relativity and Tony Hawk to skateboarding and at 9:48am (SGT) yesterday, he rolled in his grave. The reason for this was because two members of parliament (names and identity removed to protect them) could not tell the difference between a balance sheet item and an income and expense item. And worst of all, they had the audacity to add an asset (a balance sheet item) to a deficit (an income and expense item) and claimed that it turned a deficit into a surplus! 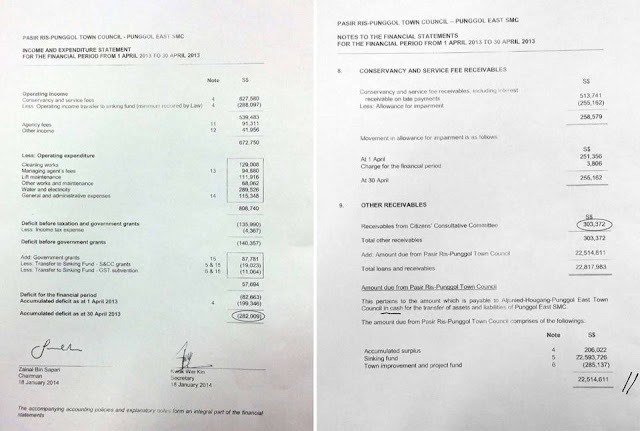 To summarise MP #2, he said that although there was a deficit of $282,009 (accumulated deficit as of 30 April 2013), there was a $303,372 receivable from CCC. So adding the 2 together, would result in a net surplus of $21,363 (see below). For those not trained in accounting, a receivable is an asset. It is not a form of income but is a balance sheet item. If you own a house, that is an asset and is therefore a balance sheet item. If you have $50 in your bank, that is cash and is an asset and is therefore a balance sheet item. If you performed a service for somebody and the person writes you an IOU, the IOU is "technically" a receivable for cash at a later stage but you would have recorded the transaction as an income in the income statement at the time of the sale.This IOU is an asset. However, you CANNOT add it to your income statement because at the time of the transaction (when the IOU was issued to you), you would have recorded that transaction as an income in your income statement. What is your deficit/surplus for the year? However, what the 2 MPs did would be equivalent to adding the $7 value of the house to the deficit and claiming that they made a surplus of $5 for that year! In conclusion, in our Parliament, it appears that basic accounting skills are very lacking. On the one hand, we have the AHPETC issue which shows signs of bad book-keeping since no auditor was willing to give an unqualified opinion. On the other hand on the opposing side, we have MPs confusing balance sheet items and income and expense items and adding and subtracting them together. Either way, both sides have demonstrated a startling lack of accounting knowledge and discipline. On Whether AHPETC Overpaid it's Managing Agent? Whether We Can Cut Military Spending by 5.75Bn. Why do Opposition Parties need to sell stuff to raise money but the PAP doesn't? Let's say you performed a service for somebody and that person paid you USD100 worth of gold. Let's say the gold is 1kg (although this is not important). At the time when you performed the service, you would have recorded the transaction as income of $100 (even though you received gold and not cash). So in your income statement you would have earned $100 from this transaction. 5 days later, you sold this gold to the goldsmith for USD $100 cash. Do you then go and record this $100 as an income in your income and expense line? If you did, you would have $200 of income but the only thing you did was a $100 service. This completely doesn't make any sense, how did this one service become a $200 income? That is because you treated an asset worth $100 (the gold) as income. Replace the gold with accounts receivables and the logic stays the same. Not to nitpick, but for your 2nd example of the car sale there would only be income of 100 if the car is held at 0 dollars on the books. If car is worth 100 there is no impact to income since all the transactions are just movements in the balance sheet and cash flow statement. Thanks, you are right and this is a good point, I am changing the example to performing a service instead, so that it is less confusing. Who are the two MPs? Don't see why you need to protect their identities considering 1/ they made public statements and 2/ they are MPs. Thanks for highlighting! Sorry typed too fast but I corrected it already. "(ii) Payments from Citizens' Consultative Committees are granted to provided funding support for community improvement projects under the CIPC scheme. Government grants are recognized at fair value when there are reasonable assurance that the attached conditions will be complied with and that the grants will be received. Grants in recognition of specific expenditures are recognised as income over the periods necessary to match them with the related expenditure that they are intended to compensate, on a systematic basis unless the accounting treatment is specified." Does it imply CIPC grant is not immediately recognized as revenue, i.e not included in P/L. It's put into CIPC fund. As when there is a need to use this fund for CIPC projects, a pair of equal income/expenditure entries will be booked in P/L. If this is the case, when handing over everything, this outstanding fund in CIPC should be taken into account right? An analogy would be children's education fund, government puts money into it but we can't use it in our monthly P/L statement unless we really pay something with it correct? Thanks for helping to clarify the facts from the "facts" put up by politicians. Great examples to help us better understand these accounting terms. Don't these politician have access to accounting experts to help them to get these "facts" right, if he/she is not that accounting knowledgeable? Or is it another genuine mistakes made by them? Or are they trying to argue their ways out by confusing the general public? Or are they, again, putting out soundbites for our mainstream media, to "bite" onto them. Ha ha. I would agree with @DanielBoy above that there is no needs to hide their names, as they are making public these information through very public medium. To the lay-person like me, when you tell me the town council is "in deficit" I would automatically assume that the balance sheet shows a deficit. So by claiming that the TC was in deficit at handover was totally misleading. Sure it was in operating deficit that year, but I don't think that should be an issue right? The whole of Sg owe a gratitude to you! But the PAP would not be so happy as you showed them to be not so financially literate! Whether it is an issue to a "lay-person" is subjective. To be honest, I don't understand why we are focusing on localized issues such as AHPETC at a general election which is a national event. 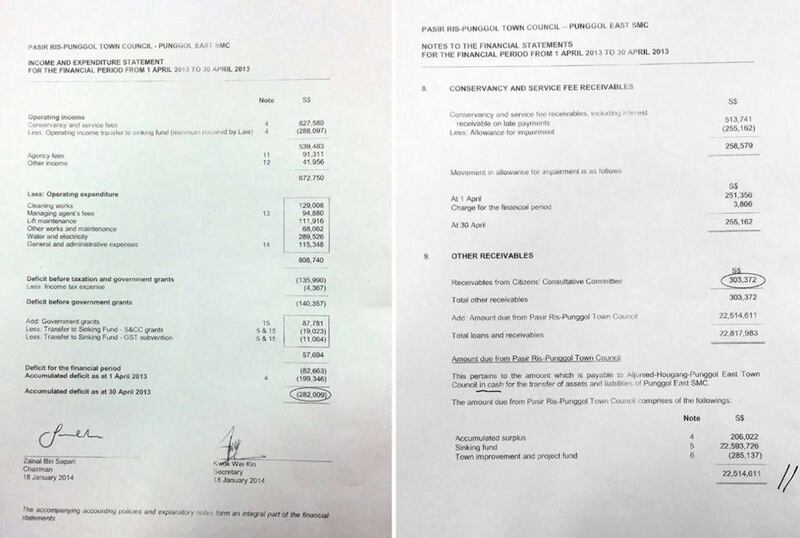 We should be highlighting national issues such as healthcare, immigration, housing, etc and not localized issues such as the finances of 1 of the 16 town councils in Singapore. Using a national platform to talk and debate about this is not fair to the residents of the 15 other town councils. Secondly, I say it is subjective because, if this is not an issue to you, then similarly, it shouldn't be an issue to you that AHPETC ran a deficit since it has significantly large levels of assets as well. 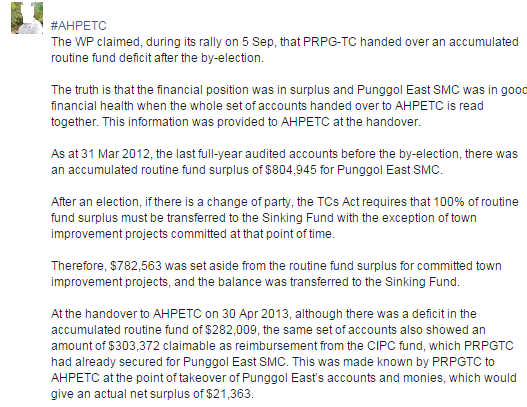 So, I think we have to ask ourselves, whether an AHPETC deficit is an issue or not. Because if it is not an issue to us, then neither should the Punggol East deficit be an issue and vice versa. We cannot just take issue with AHPETC's deficit and ignore the the Punggol East one or vice versa because that would be a double standard and would make us hypocrites. "Whether it is an issue to a "lay-person" is subjective. To be honest, I don't understand why we are focusing on localized issues such as AHPETC at a general election which is a national event. " Strange that I wonder which part you don't understand. Didn't it is the modus operandi of PAP to divert attention as shown on past elections ? Just see how much rubbish and nonsense they did to mislead the public with divert-ion, making themselves look stupid just to do a quick one. Moreover putting minimal number of days for election campaign, and much more. At this point if we still do not understand what PAP is up to then the problem don't lie with PAP, it lies with us, the naive and gullible lesser mortals. I think you are thinking about contingent assets which is a "potential" asset associated with a contingent gain. A contingent gain is a gain that is realized contingent on certain events occurring, for example a lawsuit in your favor. In this case, the grant is a receivable and not a contingent asset. It has already been recorded as an asset and the grant is likely to have already been recorded in income statement at the time it was granted. Therefore, the receivable cannot be added to the deficit to make a surplus as it would then be double counting and also as I mentioned, it doesn't make any sense. Nice blog!! Your blog is really an academic standard blog which helps thousands of students worldwide. I have felt pleasure to visit your blog and read your topics. visitors who want to know knowledgiate topics..Anyway, thanks for your blog and good luck! !